On rare occasions navigation stops working and no recalculation is triggered any more. 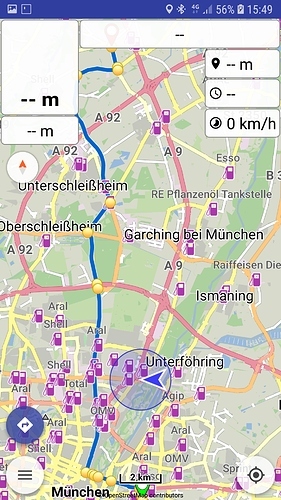 Kurviger had navigated me to munich, then throughout the day other apps had been used. I took another route as calculated by Kurviger. 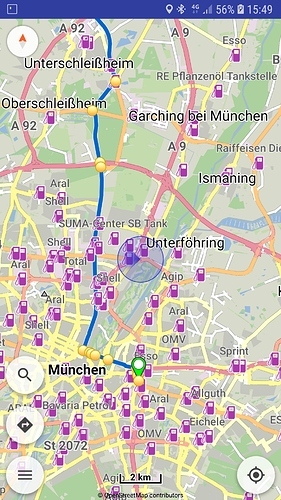 So virtually on every intersection through munich, a recalculation was executed. Then after 10-20 recalculations no recalculation was triggered any more. Many recalculations in a row seems to contribute. There, the rerouting was enabled and was not triggered? How was internet connection, any (spoken) warning? During all these, the screen was turned on or app was in background? Yes, exactly. At this time navigation had been stopping working for maybe ~15min/~10Km. 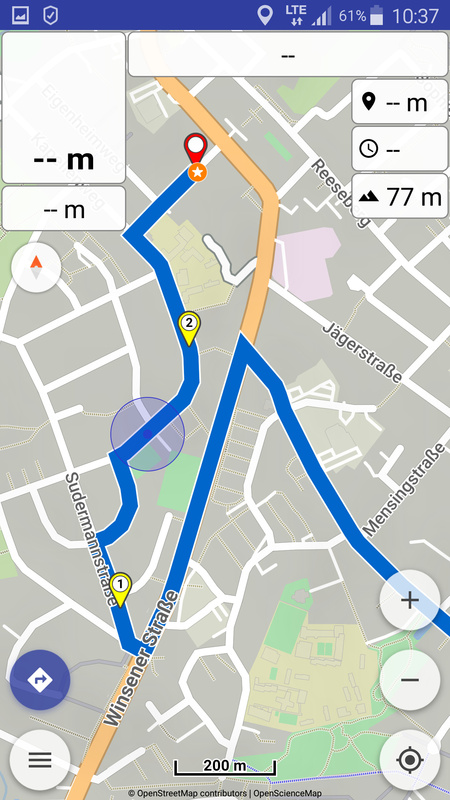 Even after “stop/start navigation” no rerouting was triggered (as you can see on screenshot). Later (at ~16:03) I stopped the app (double back) and started again. After that the route was instantly recalculated and navigation was working again. No warning I could remember of, and munich usually has excellent internet coverage. The start point on the screenshot was the last time a successfull recalculation had been taken place. Screen was on and app in foreground the whole time from “point 1.” onwards. What happens if you loose GPS signal (±) at the very moment you would detect an off route situation? Maybe in combination with Kalman filter? What happens if you loose GPS signal just (±) at the moment you would detect an off route situation? The off route detection is only triggered when getting off route significantly. So, short GPS signal loses are usually not an issue. Longer tunnels, might be detected as off-route though. Screen was on and app in foreground from “point 1.” onwards of the above report. Before “point 1.”, during the day, the app had been “running” in the background most likely (navigation off). Ich hatte gelegentlich das gleiche Problem. Manchmal stoppte kurviger pro während der Fahrt. 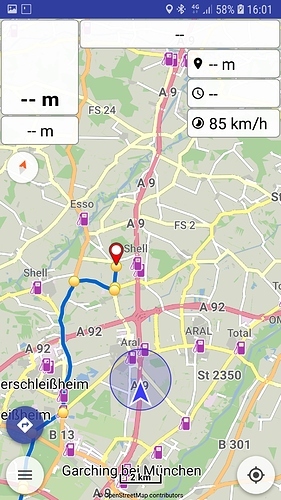 Fast immer nach Pausen, wenn also GPS abgeschaltet wurde, um Strom zu sparen. Man kann es sehen, weil keine nächste Abbiegung mehr angezeigt wird etc. Da hilft nur noch Beenden der app und Neustart, dann geht alles wieder. I occasionally had the same problem. Sometimes kurviger pro stopped while driving. Often after breaks when GPS has been turned off to save power. You can see it, because no next turn is displayed, etc. You have to quit the app and restart, then everything works again. Often after breaks when GPS has been turned off to save power. 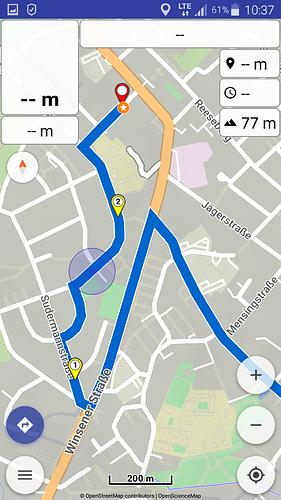 Can you describe that workflow, how GPS is turned off? By user or battery optimization, app is still active or in background? Okay, ich habe es jetzt noch einmal ausprobiert. 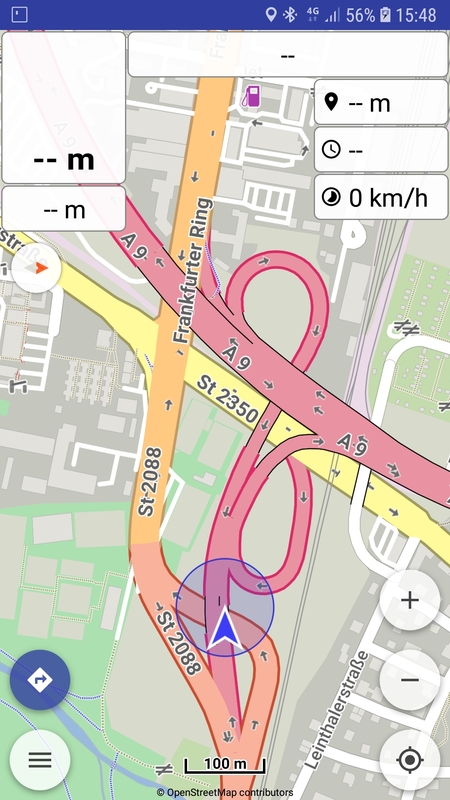 Das Problem kommt, wenn ich GPS ausschalte. Nach dem erneuten Einschalten von GPS wird die Route zwar noch angezeigt aber nicht mehr berechnet. Die Abbiegeinformationen fehlen, siehe Bild. Es findet keine Routenansage mehr statt. Okay, I tried it again. The problem comes when I turn off GPS. After switching GPS on again, the route is still displayed but no longer calculated. The turn information is missing, see picture. There is no more route announcement. I have to quit and restart the app. Then everything works again. I have also had this problem sometimes. It does seem like it looses GPS in an area when it happens, maybe too many trees for a clear signal. I can not find anything in which my phone shuts down GPS to save power and have no apps to do this. A riding friend has same problem on same ride and seems to happen to him at same times. I am thinking this app gives up or gets hung when it can’t get a GPS response for a while. A riding friend has same problem on same ride and seems to happen to him at same times. Do you both use the Kurviger Pro app and at more or less the same time the app doesn’t recognize that you are on the route? It would be interesting if you could provide a case that provides an option to reproduce this situation. So far this issue has been non reproducible and seems to occur very seldom. Both use Kurviger Pro and we both updated it sometime this year to the newest version. May or may not have and internet connection at the time. We ride on back roads and on some routes, the Kurviger route does not track with the road and could be off 10-20 feet from the road or more. Been slowly fixing them on OpenStreets.